Singing arcs and burning steel ! 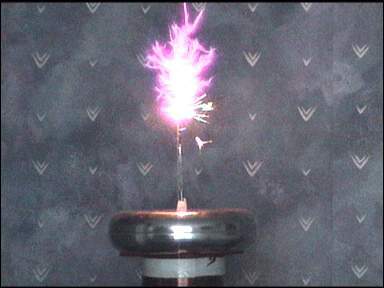 This page shows my small Solid State Tesla coil running with a steel screwdriver as a breakout point, and also contains a video of a singing arc ! Burning steel produces some really nasty fumes. When mixed with Ozone and NO2 they will surely do you harm. Therefore ensure adequate ventillation and don't breath the fumes. The plasma is hot ! 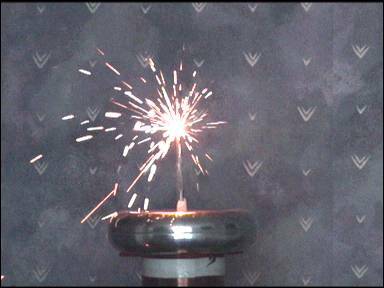 If it starts steel burning in seconds, it will damage skin in milliseconds. Do not take an arc to the skin or any held object. Hot metal particles are showered everywhere, and the screwdriver remains hot for some time after the power is cut. There is a real risk of setting fire to nearby objects or burning your skin. Give things plenty of time to cool before touching. 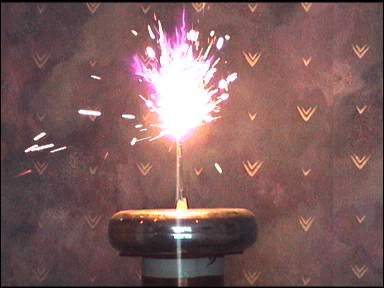 The corona discharge from the SSTC can be made to produce sound by modulating the amount of power delivered to the arc. This is similar to the way in which an AM radio transmitter works, in that it manipulates the envelope of the Radio Wave in order to impress sound onto it. The difference here is that it does not require a radio to hear the sound ! 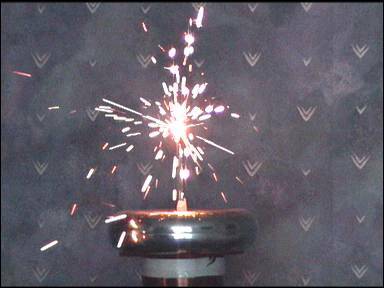 As the power delivered to the arc is varied, the temperature of the ionised air varies. If the power increases the arc becomes hotter and expands. Conversely if the power is decreased the air becomes cooler and contracts. This expansion and contraction produces the sound waves that our ears detect. There are many ways in which to modulate the amplitude of the RF generated by the driver. A very common method is to vary the supply voltage to the driver in order to modulate the RF power produced by it. Unfortunately this "high-level" modulator is relatively bulky and is very inefficient. It requires a large audio amplifier which must supply substantial power. Therefore a more elaborate solution was sought. In this instance the mains was first rectified and smoothed to obtain 340VDC. This smooth DC was used to supply the driver, and the conduction time of the MOSFETs was varied in order to control the RF output power. This method of modulation has a number of advantages over other techniques. Firsly the audio is introduced into the driver circuit which runs at a low power level and is more friendly to work on. Secondly, this Pulse-Width-Modulation is a "Low level modulation" process. It does not require a large high power audio amplifier to vary the main supply to the RF generator. The audio amplifier and modulator are effectively embedded into the solid state RF generator, to acheive a cheap, compact and efficient solution. The driver was biased to give drive pulses of half the maximum acheivable to each MOSFET. (This is in contrast to the usual practice of setting the driver for maximum power.) The audio signal from a CD player was then introduced in order to vary the pulse width around this bias point. The audio signal is capable of varying the pulse widths from almost zero, through 50%, to almost 95%. This gives a wide variation in power level due to the audio, and produces moderately loud music. The RF power level was around 75 watts with no audio applied, and the modulation depth was around 80%. Peak envelope power was around 200 watts. For this quantity of power input the sound was not particularly loud. 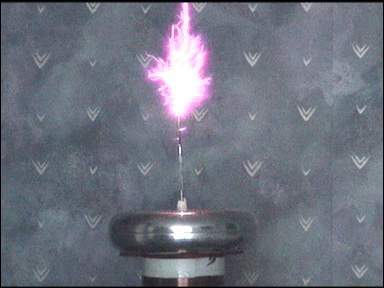 The "plasma speaker" will never win any awards for efficiency, but it was quite clear. The continuous brush discharge also produces a lot of ozone, really quickly ! 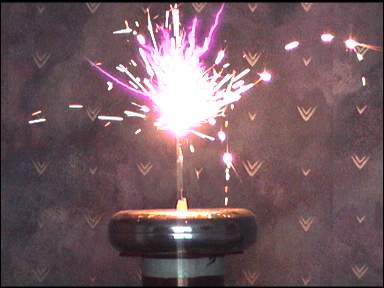 More information about this Solid State Tesla Coil can be seen by clicking here.